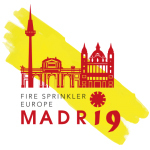 First of all the European Fire Sprinkler Network connects those in Europe who share its aim to improve fire safety through the greater use of fire sprinklers. Members regularly receive email updates on items of common interest, and can call on the Network for information and data to support local campaigns. The Network also supports this web site, which acts as a resource of information on fire sprinklers. Working with its members, the Network establishes contacts with those responsible for fire safety at a European level, so as to inform and educate them about the benefits of fire sprinklers. By joining the Network, members demonstrate their support for these efforts and so add weight to the message of the European Fire Sprinkler Network.